Gardening shovels come in different shapes and sizes. The most important thing to remember is to pick one that is comfortable for you to use. can be used for digging, lifting, and moving the dirt in your garden. When choosing your shovel, be sure the handle length is comfortable for you to use. If the handle is too long or too short, lifting and moving dirt with it may cause your shoulders or back to ache after gardening with it. to help you break up clumps in your soil if needed. The flatter blade on a spade can make removing grass clumps easier than if you were to try to do so with a regular shovel. The flat, squared-off blade makes it easier to slice under the sod or even to edge a bed. 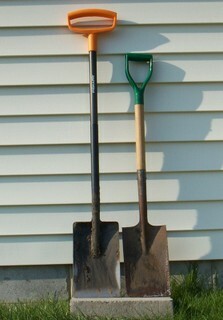 Notice that both of these tools are spades yet there is quite a difference in the lengths of the handles on each one. 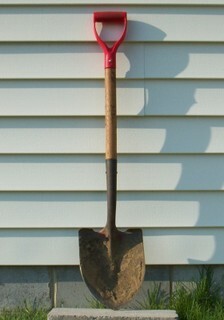 When choosing your spade or shovel, purchase a digging tool with the handle length comfortable for YOU to use. Comfortable gardening tools will add to your enjoyment of the time you spend in and around your garden. In the end, though, whichever you are more comfortable with ... the regular shovel or the spade ... the preference is yours as to which one you'll want to use to make the digging experiences in your garden enjoyable for you.